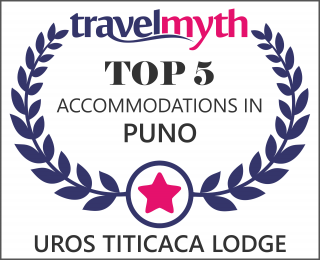 Transfer of Puno to Uros Titicaca Lodge. Day 2: farewell and transfers. At a suitable time, we will proceed to collect our fishing net that we put the previous day and see the diversity of native fish of Lake Titicaca; then we will take our breakfast and finally to average 09.00 am we return to Puno or if you want, you can continue your journey to the island of Taquile or Amantani (require by mail urostiticacalodge@gmail.com ). to the train station or bus terminal we transfer out according schedule time. 10:00 am Reception and transfer from the hotel in Puno to a pier. 10:30 am Transfer and boarding toward the floating islands of the Uros. 11:00 am Arrival to Uros Titicaca Lodge, register. 12:30 pm Lunch and siesta. Día 2: DESPEDIDA Y TRASLADOS. 07:50 am Pick up the fishing net and demonstration of native fish of Lake Titicaca. 09:00 am Return and transfer to Puno hotels or continue trip to Taquile (require tour). Transfer hotel Puno - Uros Titicaca Lodge - Puno. Activities around Uros Titicaca Lodge. Assistance or courtesy call to the hotel in Puno. Transfer to the hotel in Puno. Tour a la isla Taquile en lancha rápida (adicionar USD $ 30.00). Tour a las islas Amantani y Taquile (adicionar USD $ 50.00). Enjoy your experiences. HAVE A NICE TRIP !!! For day trips in the Lake titicaca, you generally need very little, but the following items are advisable to carry in a day pack and /or wearing them on.